The official enforcement deadline for the REAL ID Act is less than two years away! By October 1, 2020, passengers from all states will be required to show compliant documents, such as a REAL ID compliant driver’s license, to board any commercial aircraft. As states continue to pursue compliance with the Real Id Act, there is still mounting confusion for companies and their corporate travelers over enforcement deadlines and the implications for travel plans. To get a full grip on the ins and outs of the REAL ID Act, we decided to go directly to the source. World Travel, Inc. hosted a webinar on this topic with Steve Yonkers, Director of Identity and Credentialing for the Department of Homeland Security’s Office of Policy, Screening Coordination Office (SCO). Missed the webinar? No worries! 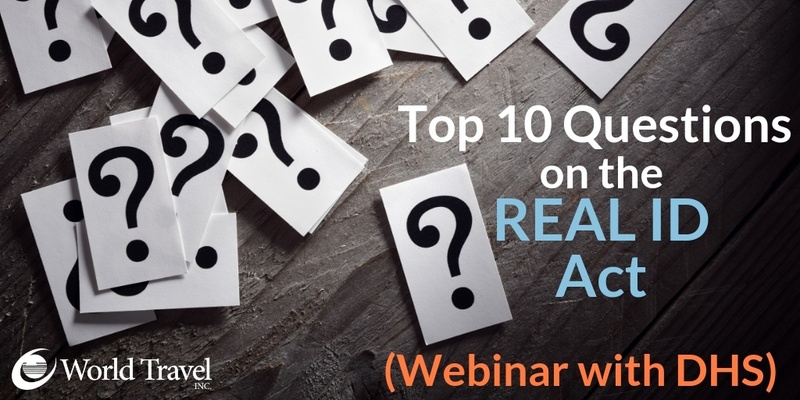 To help your company and travelers become REAL ID ready, we’ve provided the full recording below, along with the top 10 questions asked. 1. Can we get a copy of the presentation anywhere? Yes! The full recording can be accessed here and the presentation is available for download here. 2. Where can I get the most up-to-date information on REAL ID? Travelers can check DHS’s REAL ID webpage at any time to learn if your state is compliant and can check with your state’s agency that issues driver’s licenses about how to acquire a compliant license. 3. Some states issue enhanced drivers’ licenses (EDLs). Are EDLs an acceptable form of identification for official federal purposes, such as boarding an aircraft? Yes. State EDLs are designated as acceptable border-crossing documents by the Department of Homeland Security under the Western Hemisphere Travel Initiative (WHTI) are acceptable for official federal purposes such as boarding a commercial aircraft or entering a federal facility. 4. What is the difference between a Real ID compliant card and an enhanced license? REAL ID compliant cards and enhanced licenses are under completely different congressional authorities. An enhanced license is really a border crossing card. When someone gets an enhanced driver license, their information is stored to share with the border crossing authorities. REAL ID compliant cards are state-issued and are used in a different capacity than EDLs. However, since EDL does require all the same required documentation as a REAL ID card, those EDL cards will be accepted as REAL ID identification. 5. Are states issuing compliant and non-compliant licenses? All but eight states will be offering their residents the option between a compliant license and a non-compliant license. Non-compliant licenses will not be valid for entry into federal buildings or for air travel starting on October 1, 2020. 6. Why would someone chose to not get a compliant license if given the choice? Are they cheaper? Yes, the non-compliant cards can be cheaper, but the main reason people may choose to not get a REAL ID compliant card is for convenience. For obtain a REAL ID card, individuals must gather all their documentation and come into the DMV to present the identity documents. If you are not getting a REAL ID card, and are up for renewal, you can typically just complete the process online. The other issue is some people just feel they do not need it. If you have a passport that can be used for everything you would need a REAL ID complaint card for you would just need to be sure to carry it with you. 7. Several States currently have extensions through 2019. What happens when these expire? When a state's extension expires, the state is subject to the statutory prohibition against Federal acceptance for Federal purposes of the state's drivers’ licenses and identification cards. However, the Secretary may grant states with an expired extension a short “grace period” before Federal agencies begin REAL ID enforcement actions at nuclear power plants, Federal facilities, including military bases, and at commercial airports. Currently, all States are on track to be fully compliant and the DHS does not foresee any issues with compliance through 2019. 8. Is there any chance the October 1, 2020 hard start date will be extended? The REAL ID Act was passed by Congress in 2005. DHS is committed to meeting the October 1, 2020 deadline, and is confident that all required steps will be completed prior to the deadline. 9. What are the other acceptable forms of identification if travelers do not get a Real ID license by the deadline? TSA currently accepts several other forms of identity documents and will continue to do so. For more information on acceptable forms of identification for boarding an aircraft, please see the TSA website. A: Additional questions may be sent to the DHS Office of State Issued Identification Support at realid@hq.dhs.gov.